It wasn't long ago that Mike Singletary ranted about tight end Vernon Davis' poor attitude. The former San Francisco 49ers' coach joined Dennis Green and Jim Mora in the pantheon of legendary NFL news conferences. "Can't win with 'em" was shown on a replay loop. Davis was labeled as selfish, but he was the top receiving threat on the 49ers' roster. His numbers have dropped in each season under coach Jim Harbaugh, but Davis is cool with it. That's a dramatic shift from where he was. "I was walking down the street the other day, and I was looking up, and I was like, 'Wow. 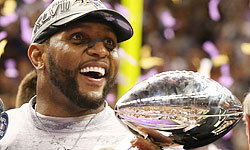 The Super Bowl,' " Davis told The Sacremento Bee's Ailene Voisin. "This is incredible. Just being a part of this franchise is legendary. Jerry Rice, Joe Montana, Steve Young. And to be able to bring a ring back ... that's something you can cherish for the rest of your life." Davis' numbers diminished as the 49ers' offense evolved. He had 914 receiving yards in 2010, 792 yards in 2011 and 548 yards in 2013. Michael Crabtree became Colin Kaepernick's favorite target. Frank Gore continues to carry a heavy load, and Kaepernick now is a part of the run game. Davis' acceptance of his role has been part of his maturation. He even recently picked the brain of Atlanta Falcons tight end Tony Gonzalez. "He blocks, catches passes and doesn't complain," Davis said, "and he takes care of his assignments. A great tight end. When times are tough, when he's not getting the ball, he doesn't complain. "I am one of them (stars)," Davis said, "and the coaches know what they have in me. When they're ready for the help, I'll be there. I think we're almost there, and when you win, everything takes care of itself." The Falcons slept on Davis two weeks ago, and he blew up with 105 receiving yards and one touchdown. The Baltimore Ravens better not make the same mistake Sunday.